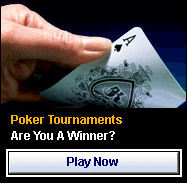 A World of Poker would like to bring you the lastest and best online promotions for you to enjoy. Please join our members club to qualify for our future promotions and offers. Betfred Poker VIP Club - Betfred Poker's Loyalty Bonus Scheme enables you to earn unlimited Bonus Dollars each month!! The bonus is based around your VIP Level and the number of Betfred Loyalty Points you have earned in the previous month. Blue Square Poker First Deposit Sign-Up Bonus - The bonus is a 100% matching sign up bonus based upon your first deposit. $2,500,000 Guaranteed Tournament - If you won $500,000 what would you do? The time has come to stop dreaming and start playing, as Blue Square Poker proudly presents it's biggest ever tournament with a whopping $2.5 Million Guaranteed prize pool! Fult Tilt Poker Big Money Sundays - With more than $1 million in combined guarantees up for grabs each Sunday, there’s never been a better way to end the weekend than by playing at Full Tilt Poker. Win your way to the WPT Bay 101 Shooting Star Championship with a $12,000 prize package from Full Tilt Poker. Full Tilt Poker will award at least 10 $12K WPT prize packages to the WPT Bay 101 Shooting Star Championship, including a $10,000 buy-in for the event and $2,000 for travel and expenses. Ladbrokes $1,000,000 Rake Race The World’s Richest Race! Exclusive for Ladbrokes Players only. Each month you will be playing for an incredible share of $1,000,000 in prizes. Plus they will be paying amazing cash prizes all the way to 3,000th place with a minimum of $50! Some say that Paddy is madder than a March hare, but he's ordered to run another cash race and throw more than $5,000 a week at the cash game players starting this Sunday, February 22nd @ midnight. For the next five weeks they are digging deep into their pockets and awarding over $5,000 each week in cash prizes. At William Hill Poker, the fun begins from the moment you start playing. Simply make your first deposit and start playing for Real Money, and you’ll be awarded with a 100% match of the deposit sum up to $/£/€ 600. Winning has never been easier!